This is the 2nd tutorial in our Resources for Photographers section, and today, we are going to show you how to build your own customized entry tab for your public Facebook Page. 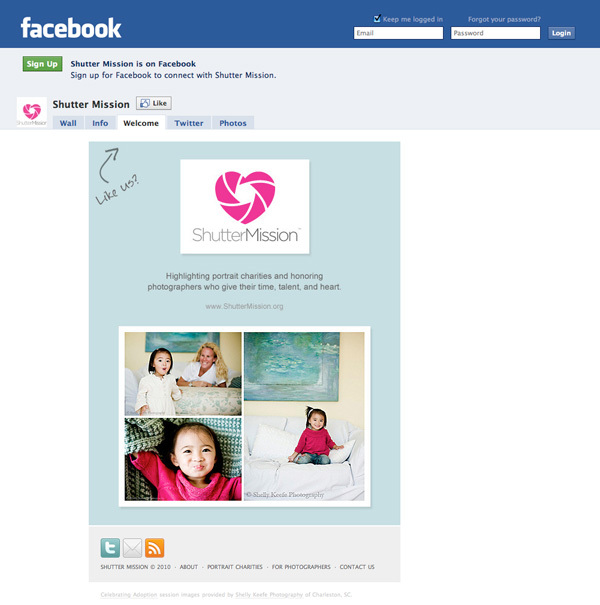 This tutorial is geared toward photography businesses and portrait charities, but really — any organization who has a presence on Facebook can benefit from a custom page. The goal for creating a custom landing tab is so that your new visitors will see your unique brand when they first visit your public Facebook Page, instead of the default Wall or Info tabs. This helps bring more exposure to your brand, as well as encourage visitors to “Like” your page and connect. 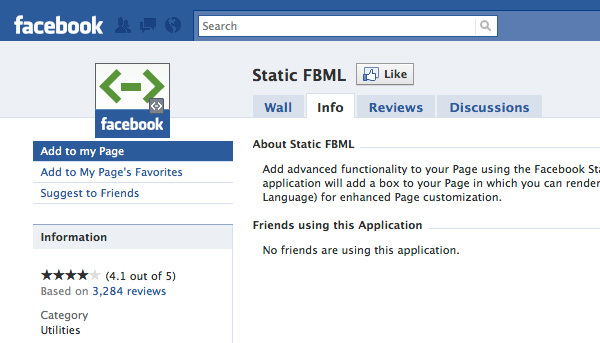 Step 1 — Add the Static FBML App to Your Page. Go the the Static FBML application and click the “Add to my Page” link beneath the logo. Step 2 — Add Text or HTML Code to the New Tab. Go to your Facebook Page, click “Edit Page”, scroll down to the FBML app, and click the “Edit” link. You’ll see a box that looks like the image below. Give your tab a title (here, we use “Welcome”), and add any text, HTML, or FBML code that you want to appear on your new tab. NOTE: Any images, stylesheets, etc., will need to be hosted remotely, so be sure to upload those to your server and use the absolute link with your domain name. Step 3 — Activate Your New Custom Tab. 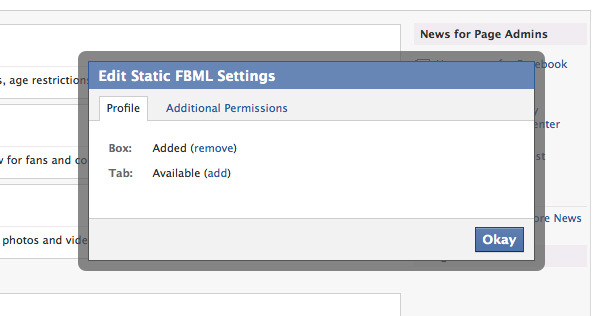 On your Admin page, scroll down to the FBML app and click the “Application Settings” link. Click “remove” to delete the new box from your Boxes tab (you don’t need this, it’s redundant), and click “add” to add the newly created tab to your page. When you view your Page, you should see the new tab. If not, click the “+” and select the tab. You can also drag/drop it into the desired position. Step 4 — Set Default Tab for New Visitors. Under “View Settings,” find the “Default Landing Tab for Everyone Else.” Select the drop-down menu and choose your newly created tab. Step 5 — You’re All Done! Log out of Facebook and navigate to your public Page. By default, you should land on your new custom tab. 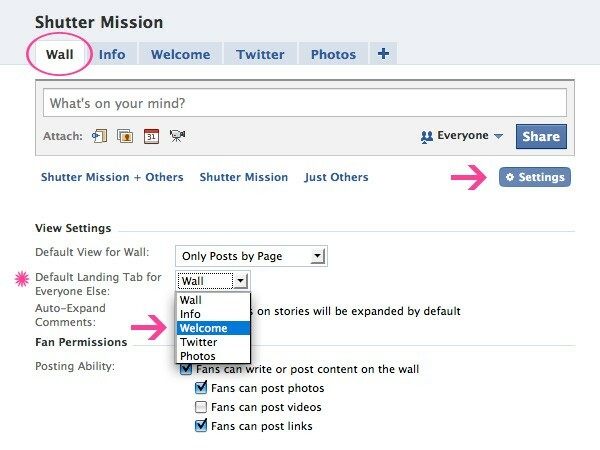 (All new visitors logged into FB, as well as any user not logged in, will land on your default tab). As of today, the max width for tabs is 760px. However, Facebook has been saying since late 2009 that this width would be shrinking to 520px some time in 2010. We’ve read that this will be happening in July, but who knows for sure. We chose to use the 520px width in our design so it wouldn’t break the layout when the new dimensions are put into place by Facebook. Just a little something to keep in mind when designing your new custom tabs. UPDATE: The Facebook Page tab width is officially changing to 520px on August 23, 2010. You can use external style sheets in your tabs, but we find it easier to use inline styles or internal style sheets. YMMV. Need more inspiration? Check out this impressive collection of custom Facebook Pages. UPDATE: We’ve added a Photoshop template of our splash page to help you get started. Just click the “download” link below! We’d love to hear if this tutorial was helpful. Hit us up with any questions, suggestions for future tutorials, or post a link to your FB page in the comments so we can check it out! It looks awesome, Laura! I’m so happy the tutorial helped! I like that you used Flickr to host your splash image. That’s a great idea! What a great tutorial! I was curious, how did you get the footer to look so professional as well? Hi, it's takes just a bit of HTML/CSS to achieve the footer. You can “view source” on the FB page to see the code, if you like.